The purpose of this publication is to list all those in my Millett of Bosavern and Millett of Marazion family trees who are associated with British India, and to detail what is known or has been discovered about them. These branches of the Cornish Millett families have had a long association with British India – the earliest known, George Millett, went to India some time after 1780 – and played a wide variety of roles – as soldiers, seamen, policemen, civil servants, judges, magistrates, law-makers, traders, tea planters etc. For many very little is known, but for others, such as Frederic Millett (1798-1856), Arthur Hill Millett (1831-1879), Hugh Ley Millett (1833-1879), Montague Millett (1839-1901), and my own great-grandfather Towers Trevorian Millett (1852-1882) much more extensive information has been discovered. Images are given where these have been found. Entries are arranged chronologically by birth date, and all information is sourced. George Millett was the ninth child of James Millett (1698-1768) and Elizabeth Tonken (born 1724), who married on 18 December 1744 at Ruan Major, Cornwall. George was born about 1759 at Ruan Major and baptised there on 16 February 1759. His date of death is unknown. According to family tradition, George went to India and was never heard of afterwards. He was supposed to have been lost at sea. Source: Boase, George Clement. Collectanea Cornubiensia: a collection of biographical and topographical notes relating to the County of Cornwall. Truro, Netherton and Worth, 1890, col. 575. George Millett was the tenth child of George Millett (1724-1781) and Ann Sandys (1724-1806), who married on 4 February 1752 at Helston, Cornwall. George was born in 1762 at Helston, and baptised there on 17 December 1762. He joined the Honourable East India Company’s Maritime Service, and was a director of the H.E.I.C. He married Elizabeth Coggan (about 1764-1823) on 21 October 1786 at St Andrew Undershaft, Leadenhall Street, London; between 1787 and 1801 they had 8 children. He was a Master Mason in 1790. George died on 17 February 1816 at Walthamstow, Essex aged 54, and was buried at Wanstead, Essex in the Coggan vault. Born in England, seaman King George packet three voyages Falmouth to Lisbon; midshipman Valentine (2) 1769/70; midshipman Royal Henry 1771/2; 2nd mate Molly to America; 4th mate London (13) 1779/80 (approved 12 November 1779, aged 24); 2nd mate Rodney (2) 1781/2; 1st mate Rodney (2) 1784/5; captain King George (4) 1786/7; captain Princess Amelia (3) 1789/90, 1792/3 and 1794/5. Source: Farrington, Anthony. A biographical index of East India Company Maritime Service officers 1600-1834. London, British Library, 1999, p. 543. Served in the Honourable East India Company’s navy and became Commodore of their fleet; Colonel of the 2nd Regiment of the Royal East India Volunteers, raised amongst the employees of the H.E.I. Company in Leadenhall Street, London, England 1809. Source: Boase, George Clement. Collectanea Cornubiensia: a collection of biographical and topographical notes relating to the County of Cornwall. Truro, Netherton and Worth, 1890, col. 569. Commander of the ship King George, in the East-India-Company’s service. Source: The Times Issue 563, 23 October 1786, p. 3 col. C.
On Friday last Capt George Millett was sworn in by the Court of Directors of the East India Company, as Commander of the ship Princess Amelia, burthen 808 tons, bound to Bengal; she will be dispatched about the 30th March 1790. Source: London Chronicle Tuesday 20 October 1789, p. 386 col. A. Source: Courier and Evening Gazette (London) Thursday 31 January 1799, p. 2 col. C.
Yesterday a Court of Directors was held at the East India House, when Capt. George Millett was sworn into the command of the Indostan, destined to Madras and China. Source: Courier and Evening Gazette (London) Thursday 27 November 1800, p. 4 col. A. An opinion having generally prevailed that the introduction of another professional Person into the Direction, who has long been conversant in your maritime concerns, would be conducive to the interests and advantage of the Company, and being encouraged by many respectable friends to offer myself to your notice, I take the liberty thus early to announce my intention of soliciting your suffrages on some future vacancy in the Direction. Having passed more than thirty years of my life in your maritime service. and having been during that time a Commander six voyages, and conducted several of your valuable fleets in safety, I trust I shall not be thought unqualified for the important trust to which I venture to aspire. I have the honour to be, with the greatest respect, Ladies and Gentlemen, your most obedient, and devoted Servant, GEORGE MILLETT. 117 Leadenhall-street, May 27. Source: The Morning Post (London) Saturday 30 May 1803, p. 1 col. A. Having some months since taken the liberty of offering myself to your notice for a Seat in the East India Direction upon some future vacancy, I beg leave to renew my solicitation for the honour of your suffrages; but alas precluded, by having recently held a situation in the ? service, from becoming a Candidate for the present vacancy, by the decease of your late worthy Director, Sir Lionel Darell, I have now only to repeat my earnest ? to be favoured with your countenance and support on some other occasion. I have the honour to be very respectfully, Ladies and Gentlemen, your most obedient and devoted Servant, GEORGE MILLETT. Leadenhall-street, 31st Oct. 1803. Source: The Morning Post (London) Tuesday 1 November 1803, p. 1 col. A. Having already signalled my intention of becoming a CANDIDATE for a Seat in the Direction, whenever a vacancy might take place, I now beg leave most earnest to intreat the honour of your Vote and Interest, to succeed your late much lamented Director, Mr. Jackson. In the diligent pursuit of my Canvas for that honourable situation, my personal application will not, I trust, be deemed intrusive; and should they be crowned with successful marks of your favourable opinion, my zeal shall be unremitted to evince the high sense I entertain of my public duty and private obligation. I have the honour to be, with the greatest respect, Ladies and Gentlemen, your devoted humble servant, GEORGE MILLETT. Wallwood House, Laytonstone, Nov. 28, 1804. A meeting of Captain Millett’s Friends will be held at the London Tavern, Bishopsgate-street, on Tuesday next, the 4th of December, at two o’clock precisely, for the purpose of considering of the proper steps to be pursued to secure the success of his application for the vacant Seat in the East India Direction. Committee Room, 2, Cowper’s-court, Cornhill, Nov. 29. Source: The Morning Post (London) Friday 30 November 1804, p. 1 col. A.
London Tavern, Dec. 5, 1804. William Williams, Esq. was called to the Chair. 1st. That this Meeting, fully sensible that the Court of Directors should at all times be composed, in due proportions, of Gentlemen best acquainted with the various concerns of the Company, in the different departments of Commerce, Territorial Acquisitions, Military and Naval Affairs, and looking to the present and probable state of the Direction in these several departments, do most heartily concur in the general received opinion, that it would be adviseable to promote the increase of the number of Directors, who, from professional education and habits, may be supposed best qualified to conduct the Naval Department, now happily become so extensive a branch of the Company’s concerns. 2nd. Resolved, therefore, That this Meeting will collectively and individually exert their utmost endeavours to promote the Election of Capt. George Millett, one of the Candidates for the present vacant Seat in the East India Direction, being, in our opinion, a gentleman in every respect well qualified to discharge the duties of that important situation, more especially in the superintendance of the Naval Branch of the Company’s Concerns, from the experience of upwards of thirty-three years acquired in that department, in which he has distinguished himself as a most able, faithful, and zealous Officer, in the service of the Company. 3rd. Resolved, That a Committee be appointed for the purpose of carrying the foregoing Resolutions into effect, and that the same be an open Committee, to meet daily, at No. 2, Cowper’s-court, Cornhill. The numerous and respectable Meeting of my Friends, Proprietors of India Stock, assembled this day, having, in the most flattering terms, expressed their opinion of my pretensions to the honour of your support to succeed to the vacant Seat in the Direction, I am encouraged by such a distinguished mark of favour and approbation, to look forward, with increased confidence, to ultimate success. I beg leave to repeat, that I shall diligently pursue my Canvas, and trust my personal applications will not be considered intrusive. I have the honour to be, Ladies and Gentlemen, your devoted humble servant, GEO. MILLETT. 2, Cowper’s-court, Cornhill, Dec. 5, 1804. Captain Millett’s Committee will meet daily at No. 2, Cowper’s-court, Cornhill, where the attendance and communications of his Friends will be esteemed a favour. Source: The Morning Post (London) Thursday 6 December 1804, p. 1 col. A. As is has been reported that it is not my intention to proceed to the ballot on the present Vacancy in the Direction, and as such an opinion, if uncontradicted, may operate materially to my prejudice, I feel it is incumbent upon me to declare that the report is wholly unfounded, and to assure you that the flattering promises of support which I have experienced in my Canvas, and the zeal and active exertions of my friends, encourage me to look forward with confident expectations of success. I therefore most earnestly entreat your early appearance in my favour, on Thursday the 20th inst. being the Day of Election. The Resolutions of a numerous and respectable Meeting of Proprietors, held at the London Tavern, on the 5th inst. have fully explained the grounds upon which I have ventured to stand forward on the present occasion. The necessity of a sufficient proportion of professional persons in the Court of Directors, who from education and habits are qualified to conduct the Naval Department, has been generally admitted; and as few Gentlemen in that line now remain in the Direction, a very laborious and important branch of Naval concerns necessarily falls upon their superintendance, and in the event of their indisposition, may therefore ultimately occasion considerable embarrassment to the Company’s Maritime Service. On these pretensions, as the only Naval Candidate, I rest my claim to your protection and support. Having no other employment, it will be my pride to dedicate my whole time and attention to the management of your concerns, and on all occasions to evince the high sense of gratitude and respect with which I have the honour to be, Ladies and Gentlemen, your devoted humble servant, GEO. MILLETT. 2, Cowper’s-court, Cornhill, Dec. 10, 1804. Source: The Morning Post (London) Tuesday 11 December 1804, p. 1 col. A.
Whereupon John Bebb, Esq. was declared duly elected. Source: The Morning Chronicle (London) Friday 21 December 1804. Although the event of the Ballot at the India House yesterday, was not equal to the kind wishes and expectations of my friends, arising principally from a number of Proprietors who would otherwise have supported me having been long pre-engaged, and the opinion entertained that I should not proceed to the Ballot, I am still encouraged by the promises I have received, and the approbation expressed of the public grounds on which I came forward to renew my solicitations for the honour of your support on the next vacancy, which may happen in the Direction. To the Proprietors who did me the honour of attending in my favour yesterday, and to my friends in particular who actively exerted themselves on the occasion, I beg most sincerely to offer my grateful thanks. And have the honour to be, with the greatest respect, Ladies and Gentlemen, your devoted humble servant, GEO. MILLETT. Wallwood House, Laytenstone, Dec. 21, 1804. Source: The Morning Post (London) Saturday 22 December 1804, p. 1. George Millett stood again for the position of Director of the East India Company at the end of 1805, and was “chosen a Director without opposition” in January 1806. Source: The Morning Post (London) Thursday 9 January 1806, p. 1. He subsequently resigned, but was re-elected on 12 April 1809. Source: The Morning Chronicle (London) Thursday 13 April 1809. George Millett’s Directorship ended by rotation in April 1813, and he did not stand again for health reasons. Source: Caledonian Mercury (Edinburgh) Monday 19 April 1813. Humphry Millett was the eighth child of James Millett (1727-1777) and Jane Nicholls (born about 1731), who married on 23 April 1752 at Helston, Cornwall. Humphry was born about 1764, and baptised on 19 February 1764 at Helston. Humphry Millett died a bachelor in India. Sources: Boase, George Clement. Collectanea Cornubiensia: a collection of biographical and topographical notes relating to the County of Cornwall. Truro, Netherton and Worth, 1890, col. 568; An account of the families of Boase or Bowes, originally residing at Paul and Madron in Cornwall, & of other families connected with them by marriage. Truro, Netherton and Worth for Charles William, George Clement and Frederic Boase, 1893, col. 111. Leonard Millett was the fifth child of Richard Oke Millett (1749-1832) and Jane Curnow (1742-1806), who married on 3 April 1770 at St Clement, Cornwall. Leonard was born on 8 September 1778 at Bodriggy, Cornwall, and was baptised on 18 September 1778 at Phillack, Cornwall. He died, unmarried, on either 8 October 1797 or 5 April 1798 (see below) aged 19 or 20. Source: St James’s Chronicle, or, British Evening Post (London) 21 August 1798, p. 1 col. B and p. 3 col. C.
The British Library holds a painting by Leonard Millett, “View of Bombay Fort from the harbour”, showing St Thomas’s church, the Custom House and flag staff, with shipping in the foreground, painted c. 1797, which has inscribed on the reverse: “Drawn by Leonard Millett the Son of Richard Oke Millett. Penpol Hayle. Leonard Millett was blown up and killed in the Princess Charlotte at Bombay with many others or nearly all of the crew – about 1797”. According to the British Library note: “The Royal Charlotte was an extra ship hired by EIC agents, along with the Isabella and Britannia, to carry gunpowder to the Cape. The Commander of the Royal Charlotte said his insurance policy would become invalid by lading with gunpowder and demanded Government indemnity in the event of loss. The gunpowder, piled up round the main mast, was struck by lightning at Kedgeree on 8 October 1797 and all on board, numbering more than 140 people, perished in the resulting explosion. The loss to the EIC totalled 29,437 rupees. Source: India Office Select Materials Record WD3867. http://www.bl.uk/catalogues/indiaofficeselect/welcome.asp. It is not known which account of Leonard Millett’s death is correct. George Millett was the eldest child of William Millett (1759-1791) and Elizabeth Stidiford (1757-1838), who married on 7 October 1784 at St Mary’s, Isles of Scilly. George was born on 8 November 1785 in Scilly and baptised there on 9 November 1785. He died a bachelor on 6 April 1815 at Southwark, Surrey aged 30, and was buried there on 8 April 1815. William Millett was the third child of William Millett (1759-1791) and Elizabeth Stidiford (1757-1838), who married on 7 October 1784 at St Mary’s, Isles of Scilly. William was born about October 1789, and baptised on 11 November 1789 in Scilly. He joined the Honourable East India Company’s Maritime Service, in which he reached the rank of Captain. William married Mary Millett (1800-1887) on 13 December 1825 at Phillack, Cornwall; they did not have any children. William died on 14 June 1841 at Leamington, Warwickshire aged 52, and was buried there on 16 June 1841. Pursar Bengal (3) 1811/12 and 1813/14, Marchioness of Ely 1815/16, 1817/18, 1819/20, 1821/2 and 1823/4. 1841: Bath Street, Leamington, Warwickshire. Source: U. K. Census Collection, 1841-1911. Charles Millett was the third child of George Millett (1762-1816) and Elizabeth Coggan (about 1764-1823), who married on 21 October 1786 at St Andrew Undershaft, Leadenhall Street, London. Charles was born on 17 February 1792 at Hatton Garden, London, and baptised on 14 April 1762 at Wanstead, Essex. He was educated at Haileybury College, Haileybury, Hertfordshire, and served in the H.E.I.C. (Honourable East India Company) in China from 1809-1834. He married Anne Crohan (1812-1899) on 17 May 1834 at St George’s, Hanover Square, London; between 1835 and 1851 they had 12 children. Charles died on 28 May 1873 at 29 Queen’s Gate Terrace, Kensington, London aged 81. Charles Millett served under the Honourable East India Company in China, and retired upon the Charter being taken away from the China establishment. Afterwards he resided at Hill place, Hants, and Maiden Erlegh near Reading. Source: Boase, George Clement. Collectanea Cornubiensia: a collection of biographical and topographical notes relating to the County of Cornwall. Truro, Netherton and Worth, 1890, col. 570. The letter book of Charles Millett, Supercargo at Canton, containing summaries of letters written by him on his business and other private concerns, covering the period 1824-1827, is held at the British Library (MSS Eur B408). Source: India Office Select Materials Record Mss Eur B408. http://www.bl.uk/catalogues/indiaofficeselect/welcome.asp. To William Baynes, Charles Millett, and James Bannerman, Esqrs. Gentlemen,– We, the undersigned British merchants in Canton, have heard with sincere regret the changes which have taken place, involving your retirement from the direction of affairs in this country; and cannot refrain from expressing to you our sentiments on the occasion. While impressed with an unqualified conviction of the purity and disinterestedness of your motives throughout the whole of your negotiations to promote the prosperity of the East India Company’s trade, which you have wisely considered as identified with the general interests of British commerce, we have, at the same time, to express our approbation of the principle of your policy, which experience has proved to be the best calculated to prevent the systematic encroachments of the local authorities, ever on the watch to increase their oppressions when submitted to, but ready to yield to firmness founded on propriety and reason. Called upon by the Bombay government at the solicitation of the commercial community of the presidency, your exertions were directed to obtain relief from the increasing exactions which threatened the extinction of their trade with this empire; and to your continued firmness in the pursuit of this object, they are indebted for important advantages. We would likewise record our grateful sense of the ready co-operation at all times afforded in our attempts to improve our commercial relations with the Chinese, to remove the disabilities to which we have been subjected, and the indignities so long and so pertinaciously heaped upon us, derogatory alike to British feeling and national character; our warmest acknowledgments are equally due for your strenuous efforts to ameliorate the condition of society, with reference to the residence of families in Canton, and the general comfort of the community. In thus conveying our sentiments on your quitting the direction of affairs, we confidently hope that the policy of your successors will not only maintain the advantages already gained, but, if possible, extend them whenever the interests of our country may call for similar perseverance and exertions. To the British Merchants in China. Gentlemen,– We have received your address, and beg to return you our best thanks for the handsome manner in which you have come forward with this expression of your sentiments in approbation of our conduct while entrusted with the direction of the Honourable Company’s affairs in this country. You, gentlemen, who have been resident in China, can best appreciate the necessity that existed for our exertions to place the trade on a better and more secure footing. We are consoled in the reflection of having done our duty to the best of our judgment and ability, while acting as guardians of the important interests of the East India Company, and endeavouring to support the honour and national character of Great Britain. We assure you, that whatever changes may await us, your kindness, evinced at this moment, will ever be remembered with feelings of the warmest gratitude. Accept our sincere regards. Source: The Standard (London) Saturday 2 April 1831, p. 1 cols. D-E (from the Canton Register 4 December 1830). Henry Millett was the fifth child of George Millett (1762-1816) and Elizabeth Coggan (about 1764-1823), who married on 21 October 1786 at St Andrew Undershaft, Leadenhall Street, London. Henry was born on 30 January 1795 at Norfolk Street, St Pancras, London, and baptised on 21 March 1795 at Wanstead, Essex. He was educated at Haileybury College, Haileybury, Hertfordshire. Between 1813 and 1834 he served in the B.C.S. (Bengal Civil Service) and the H.C.C.S. (Honourable (East India) Company’s Civil Service). He was a judge and magistrate of Burdwan, West Bengal, India. He married Amelia Helen Hogg (1811-1890) on 14 December 1831 at the Cathedral, Fort William, Calcutta; they had two children, both born in Burdwan. Henry died on 12 December 1834 on board the Exmouth, on voyage from Calcutta to Cape of Good Hope aged 39. Amelia subsequently married George Edmonstone (about 1816-1888) on 15 November 1838 at Sultanpore, West Bengal; she died on 26 August 1890 at Stitchill House, Torquay, Devon aged 79. 1810, April 30: Date of Rank as Writer. 1813, Mar 31: Execution of Covenant. 1813, Jan 25: Notification of Appointment from the Honourable Court of Directors. 1813, Dec 14: Arrived in India. 1814, June 23: Assistant to the Register of the Court of Appeal at Calcutta. 1814, Aug 13: Officiating Register of the Dacca Provincial Court. 1815, April 25: Register of the Zillah of Sarun. Regulation II of 1805, at Sarun. 1817, Jan 10: Invested with the Special Powers described in Clause 4, Section 9, Regulation XXIV, of 1814. 1817, Jan 21: In Charge of the Office of Magistrate at Sarun. 1818, Mar 3: Officiating Judge and Magistrate of Sarun. 1820, July 28: Acting Joint-Magistrate of Monghyr. 1821, April 13: Invested with the Powers described in Regulation II of 1815. 1821, Nov 27: Officiating Judge and Magistrate of Bhaugulpore. 1822, Jan 25: Register of Bhaugulpore and Joint-Magistrate Stationed at Monghyr. 1822, Dec 4: Proceeded to Europe. 1825, Oct 15: Returned to India. 1825, Nov 10: Officiating Judge and Magistrate of the 24-Pergunnahs. 1826, Feb 9: Officiating Judge of Burdwan. 1826, Feb 16: Judge of Burdwan. 1830, Aug 31: Officiating Magistrate of Burdwan. 1832, Jan 1: Sessions Judge of Burdwan. 1833, May 20: Officiating Commissioner of the Burdwan Division. 1834, Dec 12: Died on board the “Exmouth”. Source: Bengal Civil Servants’ Career Histories to 1860. Frederic Millett was the seventh child of George Millett (1762-1816) and Elizabeth Coggan (about 1764-1823), who married on 21 October 1786 at St Andrew Undershaft, Leadenhall Street, London. Frederic was born on 13 November 1798 at Wanstead, Essex, and baptised there on 28 January 1799. He was educated at Haileybury College, Haileybury, Hertfordshire, and served in the Bengal Civil Service from 1816-1848. He was a director of the East India Company. He married Maria Wintle (1808-1899) on 28 November 1828 at Midnapore, Bengal, India; between 1829 and 1847 they had 9 children, all born in Bengal. They returned to England about 1848 and lived at Woodhill near Guildford, Surrey. Frederic died on 23 July 1856 at Tayles Hill House, Ewell, Surrey aged 58, and was buried on 28 July 1856 at Ewell. In 1817 qualified “with high proficiency in the Persian and Hindoostanee languages” from the College of Fort William, an academy and training centre in Oriental Studies established by Lord Wellesley, Governor-General of British India, in Calcutta, West Bengal, India in 1800. Source: The Times 15 January 1818, p. 3 Col. A.
Bengal Civil Service 30 April 1816; acting magistrate of Shahabad 1819-1822; judge of Jessore 8 March 1827, of Allahabad 7 February 1828; judge and magistrate of Beerbohm 7 February 1829, session judge of Beerbohm 1 February 1832 to 19 February 1835; secretary to Indian law commissioners 19 February 1835 to 2 January 1837; member of council of Governor-General of India 24 May 1843, resigned 1 December 1848 when granted annuity. Source: Boase, Frederic. Modern English biography... Truro, Netherton and Worth, 1892-1921. Vol. 5, col. 212. Judge of Jessore and a Junoir merchant 1828; secretary to the Indian Law Commissioners 1837; first ordinary member of the Supreme Council of India 17 April 1844; an annuitant 1848; served on the Commission for the codification of the penal laws of India; director of the H.E.I.C. (Honourable East India Company). Source: Boase, George Clement. Collectanea Cornubiensia: a collection of biographical and topographical notes relating to the County of Cornwall. Truro, Netherton and Worth, 1890, col. 571. During the last rainy season, – a season, I believe, peculiarly unhealthy, – every member of the [Law] Commission, except myself, was wholly incapacitated for exertion. ... Thus, as the Governor-General has stated, Mr. Millett and myself have, during a considerable time, constituted the whole effective strength of the Commission. Nor has Mr. Millett been able to devote to the business of the Commission his whole undivided attention. Source: Trevelyan, George Otto. The life and letters of Lord Macaulay. 2nd edition. London, Longmans, Green & Co., 1877, vol. 1, p. 417. (Written 2 January 1837). Frederic Millett, Esq. (who was employed in 1833 to revise the civil regulations of the Bengal code, and afterwards filled the offices of secretary to the Law Commission at Calcutta, and member of the Supreme Council of India), has been appointed secretary to the commissioners [of the Indian Law Commission]. 1817, July 4: Assistant to the Magistrate of Sarun. 1817, Nov 25: Acting Register of Shahabad. 1818, June 23: Register and Assistant to the Magistrate of Shahabad. 1819, June 25 & 1820, Jan 7: Acting Magistrate of Shahabad. 1821, April 13: Invested with the Powers described in Section 2, Regulation III of 1821. 1821, June 8: Invested with the Powers described in Clauses 4 and 6, Section 9, Regulation XXIV of 1814. 1821, Oct 19: Acting Judge and Magistrate of Shahabad. 1825, Oct 2: Returned to India. 1825, Oct 13: Officiating Judge and Magistrate of Chittagong. 1826, Feb 2: Magistrate of Chittagong. 1827, Mar 8: Judge of Jessore. 1827, Sept 6: Acting Judge of Allahabad. 1828, Feb 7: Judge and Magistrate of Allahabad. 1828, Nov 27: Officiating Judge and Magistrate of Beerbhoom. 1829, Feb 7: Judge and Magistrate of Beerbhoom. 1831, Aug 9: Officiating Commissioner of Circuit, at Beerbhoom. 1832, Feb 1: Sessions Judge of Beerbhoom. 1833, Oct 1: Summoned to Calcutta on the Special Duty of Revising Civil Regulations. 1835, Feb 19: Secretary to the Indian Law Commission. 1837, Jan 2: Officiating member of the Indian Law Commission. 1837, Jan 23: Member of the Prison Discipline Committee. 1838, Jan 20: Member of the Committee of Public Instruction. 1838, Mar 26: Member of the Indian Law Commission. 1839, Feb 21: Acting Secretary to the Government of India in the Legislative, Judicial and Revenue Departments. 1842, Aug 30: Member of the Finance Committee at the Presidency. Frederic Millett is named in this Commission but did not sign the report. Source: Boase, George Clement and Courtney, William Prideaux. Bibliotheca Cornubiensis: a catalogue of the writings, both manuscript and printed, of Cornishmen, and of works relating to the County of Cornwall, with biographical, memoranda and copious literary references. London, Longmans, Green, Reader and Dyer, 1874, vol. 1 p. 360. Indian Law Commission. A Penal Code prepared by the Indian Law Commissioners, and published by command of the Governor General of India in Council. Drawn up by T. B. Macaulay with the assistance of C. H. Cameron, J. M. Macleod, G. W. Anderson and F. Millett. Calcutta, Bengal Military Orphan Press, 1837. 2 pts. Indian Law Commission. Reports, dated 21 Aug. 1840 and 10 July 1841, relating to proposed changes in the Madras judicial system. Signed: A. Amos, C. H. Cameron, F. Millett, D. Eliott, H. Borradaile. With related papers. Calcutta, 1842. 159 p.
Indian Law Commission. Report, dated 31 Oct. 1840, on the substantive law to be applied to all persons in the Mofussil not subject to Hindu or Muhammadan civil law. Signed: A. Amos, C. H. Cameron, F. Millett, D. Eliott, H. Borradaile. With an additional minute by A. Amos. Calcutta, 1840. 40 p.
Indian Law Commission. Report, dated 8 Feb. 1842, on the question of abolishing the Recorder’s Court in the Straits. Signed: A. Amos, C. H. Cameron, F. Millett, D. Eliott, H.
Borradaile. Calcutta, 1842. 39 p.
Indian Law Commission. Report, dated 26 Feb. 1842, concerning the proposed Act to amend the law relating to the limitation of suits. Signed: A. Amos, C. H. Cameron, F. Millett, D. Eliott, H. Borradaile. With a draft Act. Calcutta, 1842. 13, 6 p.
Indian Law Commission. Report, dated 2 July 1842, on the training of civil servants destined for the judicial branch and related questions. Signed: A. Amos, C. H. Cameron, F. Millett, D. Eliott, H. Borradaile. Calcutta, 1842. 49 p.
Indian Law Commission. Report, dated 17 May 1843, on the reorganization of the native judicial establishments of the three Presidencies. Signed: C. H. Cameron, F. Millett, D. Eliott, H. Borradaile. Calcutta, 1843. 51 p.
Source: British Library Integrated Catalogue. http://catalogue.bl.uk/F/?func=file&file_name=login-bl-list. Edward Millett was the eighth child of George Millett (1762-1816) and Elizabeth Coggan (about 1764-1823), who married on 21 October 1786 at St Andrew Undershaft, Leadenhall Street, London. Edward was born on 29 August 1801 at Wanstead, Essex, and was baptised there. He was educated at Haileybury College, Haileybury, Hertfordshire, and served in the Bengal Civil Service from 1820-1821. He died of cholera, unmarried, on 15 February 1821 at Calcutta, West Bengal, India aged 20, and was buried the same day at South Park Street Cemetery, Calcutta. 1821, February 15: Died, at Calcutta. Died of cholera morbus at Calcutta 15 February 1821 aged 20, or according to another account was drowned whilst bathing at Calcutta 15 February 1821. Source: Boase, George Clement. Collectanea Cornubiensia: a collection of biographical and topographical notes relating to the County of Cornwall. Truro, Netherton and Worth, 1890, col. 572. Honey Millett was the second child of John Curnow Millett (1771-1848) and Mary Honey (1788-1859), who married on 5 February 1806 at Lansallos, Cornwall. Honey was born on 1 September 1809 at Lansallos, and baptised there on 25 October 1809. He was Agent to Messrs Pascoe, Grenfell & Sons, copper-merchants, and Pursar in the HEIC (Honourable East India Company) Maritime Service. Honey married Mary Ann Turner (1814-1889) on 24 November 1834 at St Hilary, Cornwall; between 1837 and 1847 they had 6 children. Honey died of fever on 14 August 1847 at Liverpool, Lancashire aged 38. His will was proved on 18 September 1847. Midshipman Marchioness of Ely 1823/4 and 1825/6; purser Marchioness of Ely 1827/8, Thomas Grenville 1830/1, Buckinghamshire 1832/3. Leonard Millett was the third child of John Curnow Millett (1771-1848) and Mary Honey (1788-1859), who married on 5 February 1806 at Lansallos, Cornwall. Leonard was born on 27 June 1811 at Lansallos, and baptised there on 18 October 1811. He joined the Homourable East India Company’s Maritime Service. Leonard died, unmarried, at Phillack, Cornwall on 9 March 1860 aged 49, and was buried there on 13 March 1860. Midshipman Castle Huntley 1827/8 and 1829/30; 5th mate Castle Huntley 1832/3. Arthur Hill Millett was the fifth child of George Millett (1793-1850) and Eliza Amelia Agnew (1795 in Bombay -1868), who married on 31 December 1818 at Cheam Church, Surrey. Arthur was born on 12 May 1831 at Brighton, Sussex. He was educated at Rugby School; obtained his commission as ensign on 11 December 1847; served in the Punjaub Campaign during the Anglo-Sikh War 1848-1849, for which he received a medal; was second in command of the 11th Punjaub Infantry at the Siege of Mooltan September 1848 to January 1849; and fought in the Battle of Chillianwallah 13 January 1849. He obtained his commission as lieutenant in the 69th Regiment Bengal Native Infantry on 17 November 1852; became captain on 18 February 1861, major on 11 December 1867, lieutenant-colonel on 11 December 1873, and colonel on retired full pay on 9 June 1877. For many years he was Inspector-General of Police, Hyderabad assigned districts, India. He married Elizabeth Watson (1844-1910) on 15 June 1870 at Marylebone, London. He died without issue on Monday 8 December 1879 at 5, Duke Street, Portland Place, Marylebone, London aged 48. Ensign 11 December 1847. In Punjaub Campaign during the Anglo-Sikh War 1848-1849. Second in command of the 11th Punjaub Infantry at the Siege of Mooltan September 1848 to January 1849; in the Battle of Chillianwallah 13 January 1849. 69th Regiment Bengal Native Infantry: Lieutenant 17 November 1852; Captain 18 February 1861; Major 11 December 1867; Lieutenant-Colonel 11 December 1873; Colonel on retired full pay 9 June 1877. Lieutenant A. H. Millett, Commanding 2nd Jezailchees, to Major J. L. Vaughan, Commanding Field Column, Sidhonia Ghaut. Banks of the Raptee, Oude, May 14, 1859. I have the honour to forward the subjoined report of the operations carried out yesterday against the rebels in the Kurwania Sota by the force under my command. Agreeably with your orders, based upon information brought to you during the night, I proceeded early yesterday morning to Khulkulla (twelve miles), and thence moved, with the detachments marginally noted *, to Khoodawah (distance six miles), on the left bank of the Raptee. As I reached Khoodawah from the westward, Lieutenant Stewart, Adjutant of 5th Punjaub Infantry, with a force as per margin #, joined me by the direct road from this camp. The junction having been thus happily effected at 7.30 A.M., and it being probable that the rebel force was still in the place where the spy had seen it on the 12th instant, I determined upon advancing at once to the attack. The enemy were reported to consist of 50 cavalry and from 400 to 500 sepoys, all under the command of collector Khooda Buksh Khan +, and were said to be encamped in the bed of the Kurwania Sota, immediately under the hills which separate the Sonar Valley from the plains of the Raptee. The distance from Khoodawah to the Kurwania Sota is six miles, the path leading the entire way through dense jungle. We advanced in the order given in the margin §, having a small advanced guard and flanking parties from the 5th Punjaub Infantry. After advancing half a mile through the jungle, we met 12 rebel sowars, who at once turned and fled towards the Kurwania Sota. The advanced guard fired, but without killing any of the rebels. It being evident that the sowars whom we had just seen would give the alarm to the enemy, and it being most necessary that I should obtain early information as to the movements of the rebels, I ordered up half the cavalry from the rear, and sent them ahead under Native Commandant Meer Jaffir Khan, of the 2nd Jezailchees, with orders, however, to the latter not to commit himself in any unequal fight with the enemy. When we had arrived within two miles of the Kurwania Sota, one of our sowars brought back a report from Meer Jaffir Khan, urging the rapid advance of the infantry, and stating that the enemy had fallen in to the sound of the bugle, and appeared inclined to show fight. Continuing our advance as rapidly as possible, we soon reached our advanced cavalry; and looking over an intervening rise in the ground, I perceived a body of rebels collected in a flat basin of the Sota, to the number of fully 400 men. Allowing a few moments for the enemy to collect, under cover of the rising ground I detached 20 men of the 9th Company 5th Punjaub Infantry, to the right, and as many to the left, to crown the hills on either side of our advance, so as to prevent any small bodies of the enemy from getting round our flanks. The 8th Company 5th Punjaub Infantry, and No. 10 Company 2nd Jezailchees, were ordered to move steadily forward in reserve, whilst I attacked with No. 9 Company of the Punjaub Infantry, and No. 9 Company of the Jezailchees. These preliminary arrangements were speedily effected, and we at once moved over the brow of the rise to the attack. The enemy gave us a heavy volley of musketry as we showed ourselves over the intervening rise; and then, not liking the confident rush nor the wild joyous shouts of our men, they commenced a rapid retreat, but at first in good order, towards Sonar. The pursuit was at once pressed with all speed, and many of the rebels soon sought protection in the intricate nullahs to the right and left. They were, however, everywhere followed up by parties of our infantry and destroyed in all directions. In one small ravine on the right no less than 21 rebels were killed. At the same time the central pursuit was carried on with unremitting vigour, all ranks vying with each other to overtake the flying enemy. On this central path alone, I counted 44 dead rebels, and the slaughter was also heavy on our left. After continuing the pursuit for three miles over most difficult ground, I found that the enemy was utterly dispersed; and, as the heat and their exertions were telling on our men, and we were going farther and farther from water, I stopped the pursuit. You will be glad to know that our loss consisted of but 1 man killed and 2 wounded, whilst I can safely put down the enemy’s loss at certainly over 80, and the general impression is that 100 would be nearer the mark. After giving the men a short rest in the Kurwania Sota, I marched back to Khoodawah, where the men ate their dinners. From Khoodawah we proceeded to Bhojpoor (3 and a half miles) where the column separated, the Police Cavalry and the Jezailchees returning to Khulkulla, and the Punjaub Cavalry and Infantry coming to this camp, which they reached at 9 P.M. The gallantry and exertions of all under my command merit my warmest thanks, and I am especially indebted to Lieutenant Stewart for the great assistance which he rendered to me throughout the day. All behaved admirably, and I cannot, without injustice to the rest, particularize the forward gallantry of individuals. During the day the troops from Khulkulla marched 35 miles, and those from the camp 48 miles, and much of this under a more than usually hot sun. I may here mention that the rebels killed were all either officers or sepoys, and that they were all armed (i.e., the sepoys) with percussion muskets. I have this morning heard that those rebels who escaped from yesterday’s fight have fled beyond Sonar into Dang, and I conceive that they are not likely to give us any more trouble in this direction. * 16 sabres of the 14th Oude Police Cavalry, and 160 of the 2nd Regiment Jezailchees. # 26 sabres of 1st Punjaub Cavalry, and 120 of 5th Punjaub Infantry (Rifles). + Assisted by General Shere Khan. § 120 of 5th Punjaub Infantry; 160 of 2nd Jezailchees; 26 of 1st Punjaub Cavalry; 16 of 4th Oude Police Cavalry. Source: London Gazette 2 September 1859, p. 3278. The operations on the Nepaul Frontier do not seem to be either active or attended by any satisfactory results. A spirited little engagement took place on the 13th May, on the Karonla Seta Pass, Nepaul. Two companies of the 5th Punjaub Rifles, under Lieutenant Stewart, were sent out from Major Vaughan’s camp at Sidhonia Ghat at three a.m., on the 13th, and were joined by two companies of the 2nd Jezailehee Regiment, and a few cavalry under Captain Millett, at a place fourteen miles from camp, whence the force marched to a gorge in the hills where they surprised a body of rebels about 400 in number. The surprise was complete, and after a volley of about 40 paces, they took to flight, and were shot down as they climbed the steep hills in their rear, up which they were pursued 3 miles. Positive information has been received since, of the death of General Bukht Khan in this engagement. Source: Taranaki Herald 17 September 1859 Supplement, p. 1 col. D (from the Melbourne Herald 9 August 1859) via PapersPast (http://paperspast.natlib.govt.nz. Captain A. H. Millett is appointed to be inspector-general of police in the Hyderabad assigned districts. Source: The Times Saturday 27 April 1867, p. 5 col. F.
Colonel Arthur Hill Millett, late of the Bengal Staff Corps, for many years Inspector-General of Police, Hyderabad assigned districts, India, and formerly of the 69th Regiment of Bengal Native Infantry and second in command of the 11th Punjab Infantry at Mooltan, died at 5, Duke-street, Portland-place, on Monday last, in his 49th year. He obtained his commission as ensign December 11, 1847, and served in the Punjab campaign of 1848 and 1849, for which he received a medal. He obtained his commission as lieutenant November 17, 1852; became captain February 18, 1861, major December 11, 1867, lieutenant-colonel December 11, 1873, and colonel on retired full pay June 9, 1877. Source: The Times Thursday 11 December 1879, page 6 col. E.
Hugh Ley Millett was the third child of John Nicholas Richards Millett (1807-1885) and Mary Ley (about 1804-1888), who married on 15 May 1830 at St George’s, Hanover Square, London. Hugh was born on 7 October 1833 at Penzance, Cornwall, and baptised there on 4 November 1833. He served in the Army in India, including throughout the Indian Mutiny (1857-1859), reaching the rank of Colonel, 5th Punjaub Cavalry. He married Julia Maria Woodthorp Childs (1846-1935) on 18 October 1866 at St Stephen’s, Coleman Street, London; they had two children, both born in India: Ethel Maude Millett (1867-1920) the British actress, and Charles Alfred Millett (about 1874-1896). Hugh and Julia divorced on 4 August 1874. Hugh died on 11 July 1879 at Victoria Parade and Napier Street, Fitzroy, Melbourne, Australia aged 46, and was buried on 13 July 1879 in the Melbourne Cemetery. Second Lieutenant 28th Bengal Native Infantry 20 January 1852; Lieutenant 1856; Captain 1857; Brevet Major 22 December 1866. Served throughout Indian Mutiny 1857-1859 and was present in very many important engagements. Despatched on command with a squadron of 5th Punjaub Cavalry in Hazara during the Umbeyla Campaign of 1863. Lieutenant-Colonel 1866. Source: Boase, George Clement. Collectanea Cornubiensia: a collection of biographical and topographical notes relating to the County of Cornwall. Truro, Netherton and Worth, 1890, col. 580. The loss of the insurgents cannot be estimated at less than 130 or 140, and of these, I should say, some 70 or 80 were cut up by the troop under Lieutenant Millett. I cannot speak too highly of the conduct of the 1st Punjaub Cavalry, on both occasions, when engaged. The Artillery also did good service, and my thanks are particularly due to Lieutenant H. L. Millett, 1st Punjaub Cavalry; Lieutenant Martineau, 10th Native Infantry; and Dr. J. E. Tuson, 1st Punjaub Cavalry, for the great assistance they rendered me. Lieutenant W. T. Hughes, Commanding 1st Punjaub Cavalry, to the Adjutant-General of the Army, Head-Quarters, Camp before Delhi. Camp, Bulleh, 16 July 1857. Source: Supplement to the London Gazette 16 January 1858, p. 241. Gratifying military progress of a Penzance gentleman. “Military Department, Allahabad, 9th April. Capt. H. L. Millett, 28th Native Infantry, Adjutant to the Corps, to be second in command. Vice Lieut. T. Watson, appointed Commandant 4th Sikh Infantry”. In consequence of the absence, from illness, of the Commandant of the 1st Punjab Cavalry, Capt. Millett is now in the temporary command of this distinguished regiment (1000 Sabres strong), and active work is cut out for them, with Brigadier Coke’s column, in cutting off the retreat of, and, it is earnestly to be prayed, capturing the arch-fiend the “Nana”, who was thought to be in the north-west corner of Rohilcund, meditating an escape across the Ganges, where the column was stationed. We wish Capt. Millett success, and that he will have the further good fortune and much coveted honour of leading the wretch captive into Camp, with a halter around his neck. Source: Royal Cornwall Gazette (Truro) Friday 11 June 1858, p. 8. Nana Sahib (born 1824), born as Dhondu Pant, was an Indian leader during the Rebellion of 1857. As the adopted son of the exiled Maratha Peshwa Baji Rao II, he sought to restore the Maratha confederacy and the Peshwa tradition. 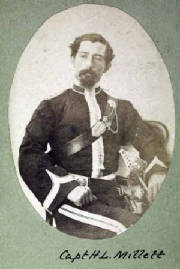 Captain Hugh Ley Millett, commanding Detachment 1st Punjab Cavalry, to Lieutenant A. 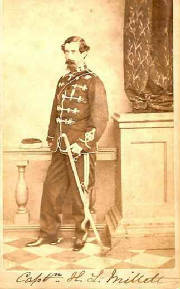 B. Temple, Staff Officer, with Major Ramsay’s force. Camp, Musha, April 4, 1859. SIR, I have the honour to report, for the information of Major Ramsay, commanding, that, agreeably to instructions I received from you, I proceeded yesterday in advance of the Kumaon Battalion, with detachments 1st Punjab Cavalry and Oude Military Police (as per margin)* at a sharp pace, to endeavour to intercept a body of rebels (reported to be 500 Cavalry and 1500 Infantry) who had left the jungle at the foot of the hills, and were threatening (and as was afterwards ascertained by me, had attacked) the Thanna of Chowradee. On arriving within three or four miles of the Thanna, my advanced skirmishers suddenly came upon a body of the rebel cavalry (their outlying picquet) to whom we immediately gave chase; they, and an infantry picquet which joined them, retiring as precipitately as possible on their main body in the vicinity of the jungle. The skirmishers, under Duffadar Sufdur Khan, 2nd Troop, 1st Punjab Cavalry, closed in, and charged them in the most gallant manner; the odds being about seven to one. The gallantry of Duffadar Sufdur Khan, and Lance Duffadar Kummeroodeen Khan, 2nd Troop, 1st Punjab Cavalry, was most conspicuous. I myself saw them engage four men (cavalry), all of whom they killed ; but I regret that Lance Duffadar Kummeroodeen Khan received a severe sabre wound on his left temple, and, had it not been for the gallantry displayed by Duffadar Sufdur Khan, he would have been killed. I continued the pursuit at the gallop, until brought up suddenly by a nuddee with very steep banks. Being now close on the main body of the rebels, who held a position on the opposite bank, we sustained for a short time a very heavy fire from musketry and rifles. My advance being thus checked, I retired with a view of drawing the enemy out into the open country, where I could again charge them with effect. In this I was disappointed, as they clung to the jungle. Being unable to act further, I immediately despatched a request that the infantry might be brought up, as quickly as possible, to dislodge them. 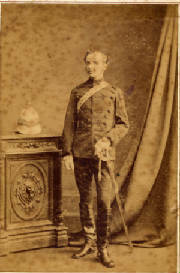 My thanks are due to Lieutenant A. F. Danvers, 1st Punjab Cavalry, who accompanied the detachment, and showed his usual zeal, and also to Lieutenant W. L. P. Drummond, of the Oude Military Police, for the able assistance rendered by himself and his men ; one of whom slew four of the enemy with his own hand. The Thanna of Chowradee held its own against the rebels ; and the Sikh Police, who fought from within its walls, killed thirteen of the enemy. I regret to add that, owing to the severity of the pace maintained throughout, two horses of my detachment died from exhaustion, and a few were lamed. Enclosed I beg to forward a numerical casualty return of the detachment under my command. Commanding Detachment, 1st Punjab Cavalry. * 1st Punjab Cavalry.—2 European officers, 108 sabres. Oude Military Police.—1 European officer, 22 sabres. Source: London Gazette 14 July 1859, p. 2742. Captain Millett was present at the capture of Bulleh, in the Kurnoul District, 15th July ’57; at the disarming of the 62nd and 69th Native Infantry at Mooltan; capture of Thannahbaon, near Mozuffurnuggur; crossing of the Ganges under Brigadier-General Sir J. Jones, advance on Nujeebabad, in Rohilcund; pursuit and dispersion of the rebels at Burrapoora; re-occupation of Bijnore, in Rohilcund, and during the Oude Campaign, ’58, ’59. Present at the attack and capture of several Forces in Oude; at the pursuit of the rebel army at Rampore Kusseah, under Brigadier Wetherall; crossing of the Gogra; pursuit of the rebels at Fyzabad, and skirmish with the Troops of the Gondah Rajah, at Muchleegaon, under Sir Hope Grant. Present at the capture of Churdah, Nujeedeeah, Bugeedeeah, and Bankee, under Lord Clyde, and in an affair with the rebels at Musha, 3rd April ’59. Medal. Mentioned in the report of Colonel Hughes to the Adjutant General of the Army, 16th July ’59. Brought to notice of the Commander-in-Chief by Major R. A. Ramsay, ’59. Appointed Detachment Staff Officer to the Moveable Column under Lieutenant-Colonel J. Brind. Source: War Services of Officers of the Bengal Army 1863. I hereby give notice that I will not be responsible for debts contracted by my wife, Julia Woodthorpe Millett, in England, India, or elsewhere, who is living separate from me; she having left my house, and declared in writing that she would “never return to it”. Dated, Mian Meer, Punjab, December 12th, 1872. Hugh Ley Millett, Major HM Bengal Staff Corps. Source: Advertisement in Daily News (London) Thursday 16 January 1873, and other newspapers. Frederic George Millett was the fifth child of Frederic Millett (1798-1856) and Maria Wintle (1808-1899), who married on 28 November 1828 at Midnapore, Bengal, India. Frederic was born on 2 December 1837 at Calcutta and baptised on 3 March 1838 at St James’ Church, Calcutta. He was educated at Rugby School, Rugby, Warwickshire and from 1855-1856 at Haileybury College, Haileybury, Hertfordshire. He died a bachelor on 6 August 1877 at Leatherhead, Surrey aged 40, and was buried on 11 August 1877 at Ewell, Surrey. Frederic George Millett joined the B.C.S. (Bengal Civil Service) in 1857, arriving in India on 15 October of that year. He was Assistant Magistrate and Collector at Bhaugulpore, West Bengal, and Magistrate and Collector of Puri, Orissa. He retired in 1877 on an invalid pension. Sources: Danvers, Frederick Charles. Memorials of Old Haileybury College. Westminster, A. Constable, 1894; Bengal Civil Service Graduation List 1869; Boase, George Clement. Collectanea Cornubiensia: a collection of biographical and topographical notes relating to the County of Cornwall. Truro, Netherton and Worth, 1890, col. 572; Rugby School Register, 1675-1857. Cinderford, Archive CD Books, 2004 (CD-ROM). Montague Millett was the fifth child of Charles Millett (1792-1873) and Anne Crohan (1812-1899), who married on 17 May 1834 at St George’s, Hanover Square, London. Montague was born on 4 December 1839 at Hill Place, Droxford, Hampshire, and baptised on 14 March 1840 at Droxford. Educated at Rugby School, he joined the Honourable East India Company Service in 1857, reaching the rank of Major General in the 43rd Regiment of the Bengal Native Infantry. He lived at Dhurmsala, Punjab, India. Montague retired in January 1893. He died, unmarried, on 27 February 1901 at Mooltan, Punjab, India aged 62, and was buried on 28 February 1901 at Mooltan. In his will he left £18,500. Joined the Honourable East India Company Service in 1857. Served with the 42nd Highlanders at the relief of Lucknow during the Indian Mutiny (First War of Indian Independence) in 1857. Barrack Master in the North West Provinces of British India. District Superintendent of Police 2nd grade. Ensign 43rd Regiment of Bengal Native Infantry 18 May 1858; Lieutenant 22 October 1858; Captain 6 March 1868; Major 5 October 1874; Lieutenant Colonel 31 October 1875. Major-General, I. S. C. (Indian Staff Corps) Punjab 1864-1887. Source: Roll of Indian Police officers 1861-1947: Superintendents and Assistant Superintendents. Appointed Colonel 31 October 1887. Appointed Major-General 1 January 1893. Source: London Gazette 13 January 1888, p. 360, and 20 January 1893, p. 333. The game of chess played with living chessmen, which was a favourite amusement in the Middle Ages, has, according to the Pioneer, been revived by Lord Lytton, who when recently at Mooltan tried the experiment with Colonel Millett. The chess board consisted of a carpet of alternate red and white calico squares a yard wide placed on the ground, and the pieces were men and boys, dressed in appropriate red and white costumes, who stood on the squares and moved at the word of command. Lord Lytton, it is said, won an easy victory. He did not, however, follow the example of a certain Emperor of Morocco, who, when playing with living chessmen, used to cut off the heads of the captured pieces. Source: The Graphic: an illustrated weekly newspaper 13 January 1877, p. 31. Richard Tracey Millett was the eldest child of Richard Millett (1807-1865) and Anne Nicholls Harris (1821-1871), who married on 19 February 1839 at Madron, Cornwall. Richard was born on 5 June 1840 at Penzance, Cornwall, and baptised on 14 August 1840 at St Mary’s, Penzance. He served in the Royal Artillery. He died, unmarried, on 28 April 1875 on board the P. and O. steamship Hydaspes, near Port Said, Egypt, on his way home from Bombay, India aged 35. R. T. Millett, Esq., eldest son of Richard Millett, Esq., of Penzance, solicitor, has been gazetted to a Lieutenancy in the Artillery, and posted to the 3rd battery of the 2nd brigade at Dover. Mr. Millett was in the second class of cadets, but an opportunity being offered these young gentlemen, they competed with the first class, and among the successful were Mr. Tracey Millett. Source: Royal Cornwall Gazette (Truro) Friday 13 January 1860, p. 5. The Royal mail steamship Arabia sailed from Liverpool, on Saturday, for New York, diverging en voyage to Halifax, to land troops. Besides the usual mails, she took out 70 cabin passengers, including 20 military officers. Among these latter were ... Lieutenant R. T. Millet. ... These officers took out under their command 14 non-commissioned officers and 220 men of the 2d and 3d brigades of garrison Royal Artillery. ..."
Source: The Times 7 January 1862, p. 7. Source: The Times 6 February 1872, p. 3; 1 October 1872, p. 3. Captain Richard Tracy Millett, of the Royal Artillery, died at sea on board the Hydaspes, on passage home, April 28, near Port Said, aged 35. He entered the service Dec. 1859; and became Capt. June 1872. Source: Colburn’s United Service Magazine and Naval and Military Journal 1875, part ii, p. 256. Additions to the Cornish ferns . Transactions of the Penzance Natural History and Antiquarian Society v. 2, 1864, p. 233. Catalogue of land and fresh water shells found in St Mary’s, Scilly . Transactions of the Penzance Natural History and Antiquarian Society v. 2, 1864, p. 108-109. List of fungi of the neighbourhood of Penzance . Transactions of the Penzance Natural History and Antiquarian Society v. 2, 1864, p. 91-94. Cecil George Millett was the sixth child of Charles Millett (1792-1873) and Anne Crohan (1812-1899), who married on 17 May 1834 at St George’s, Hanover Square, London. Cecil was born on 11 December 1840 at Hill Place, Droxford, Hampshire, and baptised on 1 April 1841 at Droxford. He was educated at Sandhurst School, Sandhurst, Berkshire, and joined the Bengal Native Infantry, reaching the rank of lieutenant on 29 March 1859. He died, unmarried, on 4 February 1865 at Bala Pass, Bhutan aged 25, and was buried at Patlakhowa Cemetery, West Bengal, India. Lieutenant Millett served in Oude from December ’58 to January ’59. Served in China, September ’59 to March ’60. Killed in action during the Duar War (November 1864-April 1865) between British India and Bhutan when Quartermaster and Lieutenant of 11th Regiment of Bengal Native Infantry. Source: Millett, George Bown. Genealogy Manuscript Book (unpublished), p. 106. An account of the Duar engagement by its Calcutta correspondent is given in The Times Thursday 16 March 1865, p. 10 col. A. CHINA 1857. BHOTAN 1865. NEW ZEALAND 1863-64-65. Lieut. 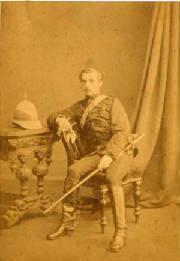 C. G. Millett, 11th Bengal N. I. Source: Mockler-Ferryman, Augustus Ferryman. Annals of Sandhurst: a chronicle of the Royal Military College from its foundation to the present day, with a sketch of the history of the Staff College. London, Heinemann, 1900, p. 78. Arthur Fenning Millett was the third child of Honey Millett (1809-1847) and Mary Ann Turner (1814 in Calcutta -1889), who married on 24 November 1834 at St Hilary, Cornwall. Arthur was born on 18 October 1841 at Newington, Surrey. He was educated at Christ’s Hospital School near Horsham, Sussex and the University of Cambridge, and joined the Indian Civil Service. He married Marianna Louisa Lane (1840-1931) on 16 August 1862 at Old Church, St Pancras, London; they had one child, Katie Flora Millett (1863 in India-1931). Arthur died on 22 December 1885 at Benares, Uttar Pradesh, India aged 44, and was buried there on 23 December 1885. Admitted to Trinity Hall, University of Cambridge 11 June 1860; matriculated Michaelmas Term 1860; Scholar 1861. Appointed to Bengal Civil Service 1861; Assistant Magistrate and Collector, N. W. Provinces, 1864-1865; Assistant Commissioner of Oudh, 1865-1881; Assistant Settlement Officer, 1866-1881; Deputy Commissioner 1881; District and Sessions Judge, N. W. Provinces, 1883-1885. Died 22 December 1885 at Benares. Source: Cambridge University Alumni, 1261-1900. Source: The Times 22 September 1860, p. 9 col. E.
Mr. A. F. Millet, assistant commissioner, third grade, Oude, has been invested with the powers of a subordinate magistrate of the first grade. Mr. A. F. Millet has been appointed to be assistant commissioner, third grade, Oudh Commission. Source: The Times 30 April 1866, p. 7. Mr. A. F. Millett, of the Bengal Civil Service, assistant settlement officer, has been appointed to officiate as settlement officer of Sultanpore, in Oudh. Source: The Times Saturday 26 June 1869, p. 11 col. F.
Mr. A. F. Millett, Assistant Settlement Officer, and officiating settlement officer of Sultanpore, has been appointed to be assistant commissioner, second grade, Oudh Commission. Source: The Times Saturday 13 April 1872, p. 12 col. B. Report on the settlement of the land revenue of the Fyzabad District. Allahabad, North-western Provinces and Oudh Govt. Press, 1880. 647 p.
Report on the settlement of the land revenue of the Sultanpur District. Lucknow, Printed at the Oudh Govt. Press, 1873. 359 p.
Edward Waugh Millett was the seventh child of Charles Millett (1792-1873) and Anne Crohan (1812-1899), who married on 17 May 1834 at St George’s, Hanover Square, London. Edward was born on 13 March 1842 at Hill Place, Droxford, Hampshire, and baptised on 18 May 1842 at Droxford. He was educated at Cheltenham College, Cheltenham, Gloucestershire. He emigrated to New Zealand in 1863. He partnered with Edward George Griffiths in the firm of Millett and Griffiths, livery-stable keepers of Christchurch who hired out ox teams. Edward married Katharine Fearon (1853-1875) on 28 January 1873 at Christchurch; they had one child, Sydney Charles Millett (1874-1950). Edward died on 10 August 1886 at St Albans, Christchurch aged 44, and was buried on 12 August 1886 at the Church of England Cemetery, Barbadoes Street, Christchurch. According to family tradition, Edward Waugh Millett was sacked from the East India Company after he criticised it for what he considered to be corruption within the Company. He was given a sum of money by members of his family and asked to go to New Zealand. 1868-69: Tamutu Station, Lake Ellesmere, Selwyn District, Canterbury Region (leasehold). 1872-73, 1873/74, 1875/76: House and stables, south side, Armagh Street West, Christchurch, Canterbury Region (leasehold). 1880/81: Livery-stable keeper, Christchurch. Freehold property at Waipara, Canterbury Region. 1881/82: Stablekeeper, Bedford Row, Christchurch, Canterbury Region. Sources: Canterbury Provincial District Rolls, 1868-1874, New Zealand Electoral Rolls, 1853-1981. Source: New Zealand City and Area Directories, 1866-1954. Francis Forbes Millett was the eighth child of Frederic Millett (1798-1856) and Maria Wintle (1808-1899), who married on 28 November 1828 at Midnapore, Bengal, India. Francis was born on 17 October 1845 at Calcutta, and baptised on 2 December 1845 at Old Church, Fort William, Calcutta. He was educated at Eton College, and was a civil engineer. Francis died, unmarried, on 1 April 1883 at Ventnor, Isle of Wight. Francis Forbes Millett returned from India to England in broken health. Source: Eton School Register, 1791-1909. Chilmark, S & N Genealogy Supplies, 1963. (CD-ROM). Henry Halse Millett was the ninth child of John Nicholas Richards Millett (1807-1885) and Mary Ley (about 1804-1888), who married on 15 May 1830 at St George’s, Hanover Square, London. Henry was born on 29 March 1846 at Penzance, Cornwall, and baptised there on 10 July 1846. He married Frances Maria Trafford (1837-1898) on 21 October 1868 at Hoshiarpur, Punjab, India. Henry died on 19 March 1877 at London aged 31, and was buried on 21 March 1877 at Colney Hatch, London. In 1864 Henry Halse Millett was appointed Second Master of the Delhi Zilla School. He was later Officiating Inspector of Schools, Lahore Circle, and Inspector of Schools, Punjab. Sources: The Times (London) Monday 29 August 1864, p. 10 col. B; Boase, George Clement. Collectanea Cornubiensia: a collection of biographical and topographical notes relating to the County of Cornwall. Truro, Netherton and Worth, 1890, col. 580; United Kingdom Census 2 April 1871. Towers Trevorian Millett was the sixth child of Richard Millett (1807-1865) and Anne Nicholls Harris (1821-1871), who married on 19 February 1839 at Madron, Cornwall. Towers was born on 28 December 1852 at Parade Street, Penzance, Cornwall, and baptised there on 24 March 1853. He was educated at Penzance under J. A. Thorne, and at St Austle under Dr Drake. He emigrated to India on 1 March 1871, and joined the Madras Police Corps. He married Kate Leslie (1851-1921) on 20 February 1878 at St Stephen’s, Hampstead, London; they had two children, Martin Leslie Millett (1878-1951) and George Nicholls Millett (1880-1962), both born at Rajahmundry, Madras. Towers died on 5 August 1882 at Rajahmundry aged 30, and was buried at Cocanada, Madras the next day. Following his death, his widow and two young children returned to England. Sailed for India 1 March 1871; of Madras Police Corps 1871; Acting Assistant Superintendent of Police Godavery, Madras to 1876; Acting Superintendent August 1878; Town Commissioner under Towns Improvement Act for Negapatam 17 May 1876. A contributor to Land and Water. Source: Boase, George Clement. Collectanea Cornubiensia: a collection of biographical and topographical notes relating to the County of Cornwall. Truro, Netherton and Worth, 1890, col. 579. 28th,– Went out looking for tracks of tiger; visited some of the hill villages, and promised the “Hill Dhoras” 100 rupees if they could show me a tiger. They professed their readiness, but were evidently not in earnest. Went through the jungles all day and found any amount of tracks of tiger quite recent. On returning home found “khubber” [news] that a large tiger had killed a fine buffalo about four miles off. Started with some constables, but did not reach the place until after dark. Found the bullock in a water-course in dense jungle. Some one said he heard a growl, and there was a stampede, and I was left alone, so I had to back out again. The tiger had eaten a large quantity, so I knew he would not return that night. Next day the Hill Dhoras came down as they saw I meant work, and, having made a screen of bushes, I and three of their best men sat there all day, hoping the tiger would come about sunset, but he did not. I have made inquiries about the tigers here, and find that in 1869 ten persons were killed by tigers, in 1870 six, in 1871 eleven, in 1872 twenty-nine, up to date, 1873, fifteen, making a total of 71 persons in five years. I am afraid this does not accurately represent the loss of life, as many persons have been missed and nothing further heard of them, and in out-of-the-way villages far away into the hills, I doubt if people trouble themselves to report such things. The mischief done to cattle cannot be exactly estimated. From information I can gather in Pachipenta I calculate that not less than 500 head of cattle are destroyed annually, and this is a very moderate estimate. In the course of my scramble among the hills I came upon no less than three villages deserted, and I am informed that more than ten villages have been deserted through the inhabitants being carried away by tigers. I came upon beautiful meadows bearing splendid grass and old fields lying uncultivated. Asking the question why these were not brought under cultivation the hillmen said “Pedda Pulli bhaiyam chata”, and this is the invariable reply. From the amount of tracks I am convinced that there are many tigers about here, but probably one does the man-eating business. Everyone here, and many persons have seen him, describes him to be an enormous tiger with a mane like a Pegue pony, and this I can vouch for as a fact, having, as will be seen hereafter, formed a close acquaintance with him. On 31st the Hill Dhoras came in during the night, and we started at dawn and tramped six or seven miles over the hills until we came to the thickest part of the jungle where they said we should find a tiger. It is, I believe, a fact that a tiger, unlike most wild animals, never breaks cover through dense jungle, but through some small path or drive; such at least is the opinion of the hillmen, and in consequence I was posted in a glade behind a bush while they went round to beat the jungle. Before long I heard two shots, the signal agreed upon if a tiger was found, and we were expecting the tiger to appear every minute, when a beater came running up to say the tiger had got into a thick bamboo jungle, and would not come out. Inspector Soobiah got left behind, he coming over the hills, and I did not like trusting constables with any spare guns, so I picked out two hillmen, and gave them to their charge. Forming the beaters into line with the matchlocks at regular intervals, and tom-toms making a most devilish row, we drove the tiger down one hill and half-way up another, using the axe the whole way, the bamboo being so dense. At last, just as I was beginning to think it all up, a beater saw the tiger lying on a stone under a clump of bamboos. There was an immediate stampede, and I thought the tiger would be among us every minute. However, three men volunteered to come with me, so we crept up the hill until we got above it, and after some time I sighted the brute between the bamboos and shot him through the shoulder; as he rose I gave him a second, which killed him on the spot. As it rolled over the stone, the matchlock men fired a volley, which did great damage to the bamboos and rocks, and one shot hit the dead tiger in the paw. I measured it and found it to be 9 ft. 7 in. in length, a splendid full-grown tigress, and very proud I felt over my first tiger. As we returned home, all the villagers rose, and I suppose a thousand people accompanied us to Pachipenta. The din and dust and glare were overpowering, and I was glad to get into my camp. Arrived, I found information that a huge tiger had killed two bullocks close to the spot from which we had just returned. I started off again, but got benighted, and had to return. On Saturday, November 1st, went to the place and found the two bullocks, one untouched and the other partly eaten. We beat the jungle all day, and about 4 p.m. I resolved to beat back towards the bullocks. I was placed in front of some bushes in the path across which it was expected the tiger would break, having with me one Gungen Dhora and Head constable Mahomed Alli. We had not been seated long before we heard a tremendous crushing of bones and tearing of flesh, the fact being that we had sat down in front of the bush behind which the dead bullock was, and the tiger was eating his dinner. As the beaters drew near, the brute began to growl, so I thought this rather too dangerous, being unable to see anything in the dense thicket in which he was. I sent to stop the beaters and bring them round to beat the tiger out, and after some time we went up in line to the bullock, when we found it dragged away a little distance. I took up a position a little further down the path and sat down with Inspector Soobiah and Gungen Dhora. After some time the brute walked across the path about 50 paces in front of me. As he caught sight of us he stopped, and I gave him a bullet through the shoulder. He dropped and lay kicking about for some time rolling, and recovering I fired again at his head, but the beaters say they heard this bullet go over their heads, so I suppose I must have missed; at all events, before I could fire again he rolled into the jungle. By the time I mustered the beaters it was sunset, and I considered it too dangerous to follow him, although I did follow him a little distance, and found a large quantity of blood where he had rolled into the jungle, and blood all about the place. He was evidently hard hit, and will in all probability die, but I doubt ever recovering his skin in this dense jungle. This tiger was an enormous animal with a distinct mane, such a huge brute I never saw; and I must say, I did not like it at all, as, had my shot missed (and a smooth bore is not the most accurate of weapons, to say nothing of a bad light), I should have, in all probability, been killed, for there was no wind to blow the smoke away, and I could not have seen him charging. I have promised the Dhoras the hundred rupees for the first tiger, and another hundred if they find this one. They all say the brute must die, and the rejoicing in Saloor, Pachipenta, and the hill villages is very great. I am very sorry the brute did not die then and there, as his skin would have been a trophy worth having. Had I better weapons I think I could render a good account of the tigers here. Source: The Western Mail (Cardiff, Wales) Saturday 14 February 1874, p. 7 col. F (in British Newspapers 1600-1900 (Gale)). The tiger shooting described above took place in October-November 1873, when Towers Trevorian Millett was aged just 21. Vizagapatam was a town and district in the Madras Presidency of southern British India, in what is now the Visakhapatnam district of Andhra Pradesh. The Rumpa disturbances, or rebellion, as some Madras papers persist in calling them, still drag along slowly without any perceptible change for the better. The Government has sanctioned the enlistment of a hundred extra constables for service in the disturbed districts, and two companies of the 17th Madras Native Infantry are being quartered at Nursapalam, but there is little prospect of any effectual steps being taken in so unhealthy a country until after the rains. Meanwhile Mr. Millett, police superintendent, is said to be shut up in Adootagala. A Madras paper states that some merchants carrying supplies for the police were captured by rioters, who, after taking from them all they had, turned them adrift unhurt, giving them, moreover, each a rupee. Source: The Times 14 July 1879 p. 7 col. A.
Mr. Millett, acting Superintendent of Police, and Inspector Abdool Aziz, lay in wait in a hollow, while the rioters surrounded them; they seem to have had no chance of escape, but a happy thought having struck one of them, a little note was written and rolled in a cigar and conveyed to headquarters without suspicion. Help arrived. The rioters were surrounded and dispersed immediately. Source: Sheffield & Rotherham Independent (Sheffield) Thursday 28 August 1879, p. 6. T. T. Millett, Assistant Superintendent of Police, died on the 5th of August. ... The loss of such a promising young officer as Mr. Millett is much to be deplored. He had done good work during the Rumpa disturbances. While travelling with the Superintendent, he fell ill of fever and was sent back in his boat from Euore to his house at Nursapoor where his family resided, but as he became worse he was brought to Rajahmundry and was under treatment for a week before he succumbed to typhoid fever. Mr. Millett had previously on several occasions suffered much from attacks of fever both in Vizagapatam and this District. Source: Administration Report of the Madras Police for 1882. Madras, Government Press, 1883, p. 21. All who knew him or who know his relatives will much regret to hear of the death of Mr. T. T. Millett, of Penzance, youngest brother of Mr. George Bown Millett, and a gentleman of solid attainments and shrewd observation as well as of great coolness and bravery. Mr. Millett, who was in the Madras police force, had been subjected to attack after attack of fever, which he no sooner got over than he was again at the post of duty – cheered by that thought, and the prospect of a prolonged holiday. A severer stroke than ever completely prostrated him. Removed to his home he has to be conveyed by water (a journey of 24 hours) for medical aid, and in spite of high medical skill, his wife’s devoted nursing, and the great kindness of English friends, he died. Mr. T. T. Millett was born on the 28th December, 1852, at the house in Parade-street, now Messrs. Rodd and Cornish’s offices, and was educated by Mr. Thorne and Dr. Drake, then of St. Austell. He left Penzance 14th February, 1871, sailed for India 1st March, and, soon after his arrival in our great dependency, entered the Madras police, in which, after various examinations, he was rapidly promoted, and at the time of his death, was next on the list for a superintendentship. After six years of harassing work in a trying climate, Mr. Millett came home in the summer of 1877. His friends were delighted not only with the progress he had made, but with the kind way in which, by pen and in lecture, he told us of what he had seen in India. Mr. Millett had with him 40 men, two of whom were shot by the rebels. One of his force was able to get off with the cigar alight, as though he were smoking. This life-saving little rolled note is now in the possession of Mr. George Millett, as well as the rebels’ flag, which Mr. T. T. Millett sent home as a trophy. A bad attack of jungle fever followed the exposure and privations. On the 20th February, 1878 Mr. T. T. Millett married, at St. Stephen’s, Hampstead, Kate, eldest daughter of the late Walter Alexander Leslie (Surgeon Major Indian Army), and shortly after returned to India. The illness of our young townsman had – as that of any young Englishman would who dies far from home, though blessed with the presence of loving relatives – some touching incidents. It seems that Major Hoskins, Mr. Millett’s chief, arrived at Mirsapur in the beginning of July and, while moving about with him, on inspecting duties, Mr. Millett was attacked with delta fever. As soon as he was a little stronger he followed Major Hoskins, to continue their work, though he was so weak, throughout July. The weather was wet, the rivers were swollen, their banks overflowed, and the water was up to within 10 or 12 yards of Mr. Millett’s drawing-room steps. It was feared by Mrs. Millett and Miss Sarah Millett that so much damp, and the tent-life Mr. Millett so graphically described for Penzance people, would bring a return of fever to the husband and brother. Their forebodings appeared to be well founded. On Friday, July 29th, Mr. Millett’s orderly arrived with the bad news that his master had been down in fever for four days and was very weak. He had been brought home by river. A mattress was sent down to the riverside and six bearers brought the sick man to his home and to his alarmed wife and sister. At time delirious, occasionally a little better, Mrs. Millett determined to move her husband to Rajahmundry, where the medical aid of Dr. Buck and the assistance of truly kind and good English friends could be gained. This removal (by boat) occupied 24 hours. In spite of unremitting attention the fever raged. Miss Millett and her charge – Mr. T. T. Millett’s two little boys – were sent for. They reached Rajahmundry too late. On the night of the 5th of August Mr. T. T. Millett died. His last letter referred to Penzance and of his desire to toil on and eventually to settle here. In his delirium, anxiously watched by his faithful wife, who never left his bedside for six days and nights, he babbled of scenes and incidents which were strange to her. Doubtless his last thoughts were of the home he loved so well, and we can only faintly reciprocate that feeling by saying how much his friends regret the end of a useful and promising life and how sincerely they sympathise with his bereaved widow and mourning relatives. Source: The Cornishman (Penzance) Thursday 14 September 1882, p. 4. “Old John Company”, by the late Towers Trevorian Millett, of the Madras Police. “A brief review of the early history of the Honourable East India Company, familiarly yet affectionately styled by its servants Old John Company.” The Cornishman (Penzance) Thursday 28 May 1885, p. 7, Thursday 4 June 1885, p. 7, Thursday 11 June 1885, p. 7, Thursday 18 June 1885, p. 7. George Prideaux Millett was the second child of John Curnow Millett (1828-1870) and Emily Vincent Vivian (1841-1927), who married on 1 January 1861 at St Mary de Lode, Gloucester, Gloucestershire. George was born on 23 March 1863 at Longford, Gloucestershire, and baptised on 19 May 1863 at Gloucester. He was educated at Abbey School, Penzance, Cornwall under J. 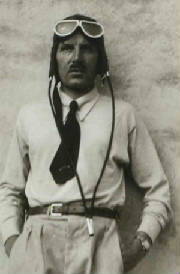 A. Thorne, and joined the Indian Forest Service. He married Saidé Russet Millar (1875-1971) on 23 September 1896 at St Margaret’s, Westminster, London; between 1897 and 1917 they had nine children, the first two of whom were born in Maharashtra, India. George was awarded CIE (Companion of the Most Eminent Order of the Indian Empire) on 3 June 1915. He died on 29 December 1950 at Shepherd’s Bush, London aged 87. Passed 6th out of 120 in Civil Service examination March 1879; passed 5th for Indian Civil Service February 1882. Source: Boase, George Clement. Collectanea Cornubiensia: a collection of biographical and topographical notes relating to the County of Cornwall. Truro, Netherton and Worth, 1890, col. 574. Boy Clerk, Army Clothing Department, 1879. Source: London Gazette 1 July 1879, p. 4214. Source: Bombay Gazetted Civil Servants 1899. CIE 1915; Conservator of Forests, Bombay Presidency. b Longford, near Gloucester, 23 March 1863; s of J. C. Millett, Penzance; m 1896, Saidé Russet, d of late Charles Gibson Millar, CE, Melbourne, Victoria; three s four d. Work: Entered Indian Imperial Forest Service, 1884; Senior Conservator of Forests, 1911; retired, 1918; Additional Member of Bombay Legislative Council, 1911-12, and 1914; King-Emperor’s Durbar Medal, Delhi, 1911; Captain Cheshire Regt (TF), 1915; TFR 1917; Timber Supply Dept, Board of Trade, 1917-21. Address: 21 Holland Villas Road, Kensington, W14. Died 29 Dec. 1950. Source: Who Was Who 1897-2006. Mr. George Prideaux Millett, C.I.E., formerly Conservator of Forests in the Bombay Presidency, died at his home in London yesterday at the age of 87. The son of Mr. J. C. Millett, he was born on March 23, 1863, and entered the Indian Forest Service in 1884. In 1907 he was appointed Conservator of Forests in the Bombay Presidency and he reached the rank of Senior Conservator in 1911. In the same year he was appointed an additional member of the Legislative Council of the Presidency and served as such for some 12 months. He was again appointed to the Council in the same capacity in 1914 and was made a C.I.E. in the course of the next year. However, he obtained leave of absence to join the Territorial Forces and served as a captain in The Cheshire Regiment until seconded in 1917 to the Board of Trade to work in the timber supply department. He continued in the department until 1921, having formally retired from the Indian Forestry Service in 1918. He married in 1896 Saidé Russet, daughter of the late C. G. Millar. There were three sons and four daughters of the marriage. Source: The Times Saturday 30 December 1950, p. 8 col. D.
Katie Flora Millett was the daughter of Arthur Fenning Millett (1841-1885) and Marianna Louisa Lane (1840-1931), who married on 16 August 1862 at Old Church, St Pancras, London. Katie was born on 6 June 1863 in India, and baptised on 26 March 1864 at Old Church, St Pancras, London. She married Edward Mair (1847-1935) on 17 January 1881 at Lucknow, Uttar Pradesh, India; they had three children, all born in India. Katie died on 9 August 1931 at Kensington, London. Lieut. Colonel Edward Mair, Bengal Medical Service (ret. ), died in London on November 22nd, aged 88. He was born on July 3rd, 1847, the son of Mr. John Mair of Ellon, Aberdeen, and was educated at Aberdeen University, where he graduated M.B., C.M., with honours, in 1872. Entering the I.M.S. [Indian Medical Service] as surgeon on March 31st, 1874, he became lieutenant-colonel after twenty years’ service, and retired, with an extra compensation pension, on July 3rd, 1902. Most of his service was spent in the Jail Department, chiefly in the North-West, now the United Provinces, where he served as superintendent of the central jails at Meerut, Benares, and Bareli successively, and was appointed Inspector-General of Jails in Bengal in August, 1898. Source: British Medical Journal no. 3908, 30 November 1935, p. 1080. Humphry John Curnow Millett was the first child of George Prideaux Millett (1863-1950) and Saidé Russet Millar (1875-1971), who married on 23 September 1896 at St Margaret’s, Westminster, London. Humphry was born on 29 June 1897 at Bandora, Maharashtra, India and baptised there on 29 August 1897. He served in the Royal West Kent Regiment (second lieutenant) and Royal Army Service Corps (lieutenant) in the First World War. Humphry married Barbara Vincent (1900-1985) on 29 October 1921 at St Thomas Cathedral, Bombay. They had four children, three of whom were born in India. In 1923 Humphry was living at Dharwar, Bombay Presidency. He died on 24 March 1987 at Chagford, Devon aged 90. Humphry John Curnow Millett took a number of short 8mm films of his life in India in the 1930s. These include: Behind My Bungalow; Behind My Bungalow 2; Burglars’ Bliss; Cine Magazine; Coronation Bombay King George VI 1937; The Holy Roller; 90 Degrees in the Shade; Pawn Takes Queen; Snipe; Thread Ceremony; Tiger Beat; Transpurna Bridge Construction; The Unfinished Tour; Voyage Around Bombay Harbour. These films may be viewed at http://archive.org/search.php?query=humphrey%20Millett. The films were placed in the archive by Humphry’s grandson John Timothy Oke Millett. Source: John Timothy Oke Millett (born 1972). Peter John Curnow Millett was the third child of Humphry John Curnow Millett (1897-1987) and Barbara Vincent (1900-1985) who married on 29 October 1921 at St Thomas Cathedral, Bombay. Peter was born on 26 October 1925 at Karwar, India. He married Joan Ross Wyllie (born 1924) on 24 July 1952 at Chagford, Devon; they had three children, all born in India. Peter died on 9 May 2016 at Drewsteignton, Devon, and was buried there on 24 May 2016. Peter John Curnow Millett was a tea planter in Assam, India. Note: References are to biography numbers.